We can help you reduce your debt payments. At Hoyes, Michalos & Associates Licensed Insolvency Trustees we can help you develop a plan to reduce your monthly debt repayments to a level you can afford. We can negotiate new payment terms with your creditors through a consumer proposal or, if necessary, help you file for bankruptcy. We will also talk to you about your other options including debt consolidation and credit counselling. Our goal is to find the best solution to meet your specific needs. Our head office insolvency and consumer proposal team includes Kitchener Licensed Insolvency Trustees, Scott Schaefer and Ian Martin. Scott and Ian understand how debt problems affect not only your financial health, but also your family and emotional well-being. 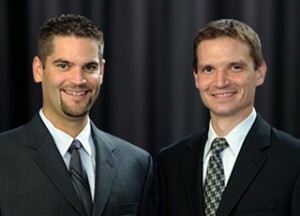 In our Kitchener bankruptcy office, Scott and Ian provide respectful, confidential, custom-tailored advice so you can gain debt relief. Relieve your financial stress. Contact us today. Our Kitchener bankruptcy office is located on King Street next to Central Meat Market and across the street from KCI high school. Access to the building is available at both the front and rear of the building. Parking is in the back of the building – please use spots marked Hoyes Michalos Visitor Parking.